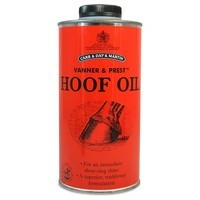 Vanner & Prest Hoof Oil is a superior and traditional formula to help maintain healthy hooves that will penetrate into the hoof and stop them from becoming too dry and cracking. Combining Pine Tar Oil with Mineral Oils, Vanner & Prest Hoof Oil also provides mild antibacterial properties, whilst giving off a pleasant and distinctive aroma. Great for giving a traditional show-ring shine, whilst maintaining healthy hooves. Apply with a hoof brush to the entire hoof for an immediate shine. With regular use, 500ml will last for up to 2 months.